"All I want to know is where I'm going to die, so I don't go there." I love that quote -- even more now. In the last entry I related the story of our abrupt departure from Silverton, Colorado due to the death of a close family member. A few minutes before the Hardrock awards brunch last Sunday my brother called with the sad news that his wife of 45 years had died during the early morning hours. Although not totally unexpected, we weren't expecting the bad news as soon as this summer. Jim and I considered Marge our sister, not just a sister by marriage. It was obvious from the outpouring of love the family received before and after the funeral just how much of an impact she had not only on family members, but also the whole community in which she lived. 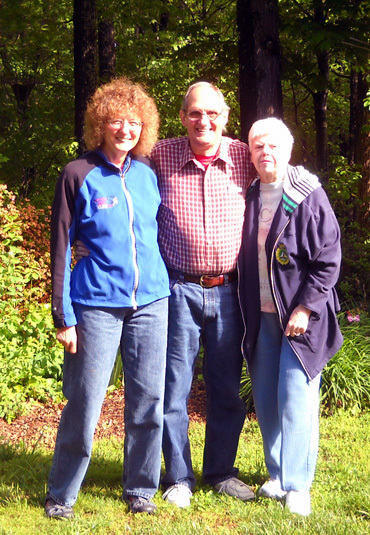 of Bill, Marge, and me in May at our house in VA.
We didn't know when the funeral would be until we were on the road, heading to Ohio. We just knew we had to get there as quickly as we could (short of flying, which we hope we never have to do again because it isn't fun to fly on a commercial airplane any more). We spent the day Sunday preparing for the ~ 1,600-mile trip east with Cody in the truck. We left the camper at a friend's house in Silverton and packed what we thought we'd need for a week on the road. That was difficult because we're used to traveling with everything we need -- and then some -- in our camper, but hauling it would have slowed us down too much. It was also important that Jim keep his appointment on Monday morning down in Durango for his third Euflexxa knee injection. That meant cramming all those miles into two days of travel. By driving through the night we were able to reach our destination late Tuesday afternoon, in time to visit with my brother and his two daughters' families for a while on Tuesday evening and Wednesday. We were also able to visit with some other relatives before and after the funeral on Wednesday but everyone who came from out of town left after that so Bill would have more time alone with his two daughters and their families. It was good to see some relatives we hadn't seen for a while; we just wish the "reunion" could have been longer and under different circumstances. Jim and I took three days to get back to Colorado. It was a lot less stressful driving about 600 miles a day and not 800. We left Ohio on Thursday morning, giving us time to visit three of Jim's siblings and their spouses in Illinois that afternoon and evening. We stayed overnight in Kansas on Friday and returned to Silverton late this afternoon. Needless to say, we're exhausted. Besides the emotional strain of the funeral, we drove a total of 3,295 miles while we were gone, most of it in just five days of travel. We are happy to get back safely -- and to be able to sleep in our own bed tonight. Don't get me wrong. We are very glad we went to Ohio but deeply sorry a funeral was the reason for the trip. It was important for us to grieve with our family and offer comfort to Marge's closest remaining relatives. That's the short version of what we've been doing the last week.. In the rest of this entry I'll talk a little more about the trip (especially things that would be pertinent if we'd been hauling the Cameo), how we adapted to life without the comfort of our rolling residence, and some lessons we observed that will hopefully be helpful to us and others in the future. 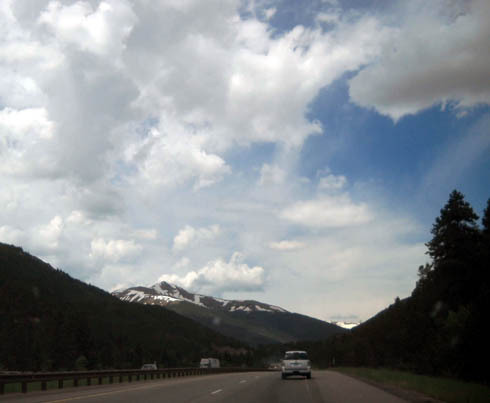 The photos in this entry are mostly from the miles we drove in Colorado on the way out and back. I took only a couple pictures in the other states through which we passed and, for privacy reasons, I usually don't include family photos on this website. This road trip felt pretty weird to us in many ways -- not just the circumstances that took us to Ohio, but also being without our RV. We aren't used to having to go inside rest areas or places of business (gas stations, restaurants, Walmart, etc.) to use the bathroom in transit -- much simpler, faster, and sanitary to use the bathroom in our camper. Although Jim sometimes stops at fast food places like Subway for lunch when we're traveling in the Cameo, we get most of our food and eat most of our meals in our camper -- also easier, cheaper, faster, and more nutritious. Ditto for our clothes (drawers and closets full), Cody's stuff, electronics, tools, etc. We're used to having everything we need with us in the camper. We had to be very choosy about what we took with us in the truck. Since I have a PC and wide-screen monitor, I didn't even have my computer for six days. I don't even want to think about the packing decisions we would have to make if we flew somewhere in a plane . . . Smoke signals? 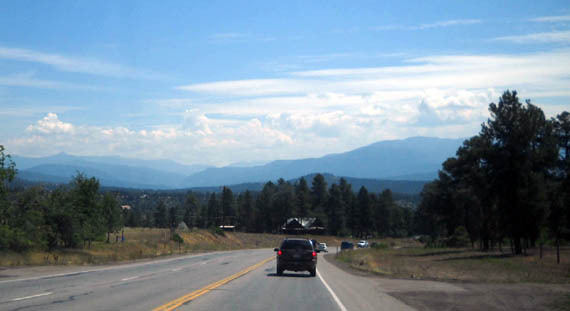 US 160 in southern CO. The reasons we left the camper in Silverton made sense -- we could drive 10-15 MPH faster without it, we got better fuel mileage, we saved some wear and tear on it, and we didn't have to worry about the maneuvering room at the gas stations we chose for fill-ups. Even knowing all that, I was envious of every RVer I saw on this trip! The camper is just so darn handy and it's truly a part of us after we've spent so much time traveling and living in it. For us, traveling several days without it was much more complicated. It's been a good learning experience, though. We've talked several times previously about temporarily storing it somewhere out West when we go back to our house in Virginia in the spring and fall. If we finally try that this fall we've learned some things from this excursion that will make it easier. If you've read any of our travel entries over the past few years, you know Jim and I often stay at a Walmart or Sam's Club parking lot overnight when we're in transit between camping destinations. Many of their stores are convenient to freeway exits, most have large parking lots and allow RVs to park overnight, and they are handy for picking up items we need to buy. Staying overnight at a Walmart parking lot in a passenger vehicle isn't the same. We never intended to stay overnight at Walmart on this trip. We knew we'd have to stay in motels for several nights. Nor did we intend to drive almost all night on Monday, our first night on the road to Ohio. 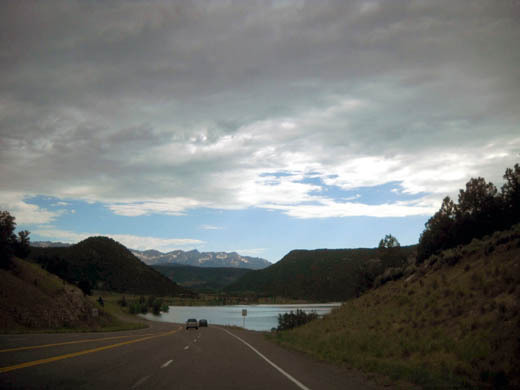 But it took so long to get through the mountains of southern Colorado on two-lane roads before reaching I-25 and I-70 that we felt we had no other choice. By Monday afternoon we knew the funeral was going to be on Wednesday afternoon. We wanted to reach my brother's house in Ohio by Tuesday evening so we could visit longer. That meant driving about 780 miles on Monday and 780 on Tuesday. Jim did the math when we reached the Colorado-Kansas border at 7 PM and determined we'd have to drive all night to get to Ohio by the next afternoon. We also had to factor in that we'd be losing two hours going this direction, from Mountain to Eastern DLS Time. We didn't have time to stop for several hours in a motel overnight. Ugh. The only good thing about this plan was saving money on a motel room that night. We were both pretty zonked by 2:30 AM and decided to pull into a Walmart on the eastern side of Kansas City, MO. There were several RVs and semis in the nether-reaches of the parking lot. We looked for a safe place to park out of the truck delivery lane and entrances to the doors, then went inside one at a time to use the bathroom and wash our faces. Cody was asleep in the back seat and Jim was able to doze in the driver's seat for a little while but I was too uncomfortable in the passenger seat, too wired from the caffeine I drank to stay awake so I could help drive, and a little paranoid about all the activity around us. My legs cramped because I couldn't stretch out or lie down. The parking lot was noisy even with earplugs -- what were all those people doing there at 3 AM on a Tuesday??? It was too bright; you can't draw the shades in a pick-up truck like you can do in an RV. Sleep for me was a futile endeavor. In addition, it was still hot in the middle of the night. The Midwest, Plains, and East were in a heat wave all week with 100+ F. temperatures. It didn't cool off much that night, either. We had to keep the windows down to let in what little breeze there was; that's where my paranoia came from. After spending two months at elevation in the Rockies this summer we just aren't acclimated to heat like that so the whole trip was a challenge in that regard. We were back on the freeway in about an hour that night and reached our destination in Ohio at 5:30 PM on Tuesday. Although we weren't thrilled with the budget motel we chose, at least we had a cool, dark, quiet room, a door we could lock, a microwave and refrigerator, TV and WiFi, and a reasonably comfortable bed to sleep in the next two nights. Almost as good as a night at Walmart in our RV! We haven't used suitcases for many years. The closest thing we have to suitcases in the camper are several rather small canvas duffel bags from Leadville and ATY races. That's one of the things that made packing for this trip a challenge. How do we each pack a week's worth of clothes into one or two small duffel bags, especially when one outfit has to be dressy enough for a funeral? It helped that we knew the weather forecast for the middle of the country predicted hot temperatures all week; we didn't have to take any bulky clothes with us, mostly shorts, lightweight convertible pants with zip-off legs, and t-shirts. We didn't want to bother with doing laundry while we were gone so we took a week's worth of clothing and got most of it in two duffel bags each. A backpack held all of our toiletries. Taking Cody with us presented some challenges, too, mostly where to carry things while we were driving. He needs two-thirds of the back seat, which folds down for a wide platform between the seat backs, to have enough room to lie down comfortably and move around. He did fine in that space the whole way out and back. We had to carry most of our things in the bed of the truck. That required protecting everything from being blown out at freeway speeds and getting wet if it rained. Luckily, we were already prepared for this because we plan to leave the camper out West this fall for several weeks when we go back to our house in Virginia -- and we may have even more stuff to haul in the truck then. This summer we brought along six large, sturdy gray plastic boxes with lids. We used four of them on our trek to Ohio this week. They held our duffel bags with clothes, the backpack with toiletries, our spare shoes, non-perishable foods like cereal and coffee, utensils, paper plates and bowls, Cody's stuff, and other items that didn't need to be in the truck with us. The boxes rode very well in the truck bed with duct tape securing the lids. We kept Jim's laptop, the cooler, a small safe, dressier clothes on hangers for the funeral, and other items in the back seat with Cody. We knew ahead of time that security would be an issue with the boxes in the back of the truck but we didn't have much choice since we don't have a lockable cover for the bed. Only one of us could go into a rest area bathroom or store at a time, and at night we had to either take the boxes inside the motel with us or put them inside the truck to avoid potential theft. That wasn't too bad with only four boxes, since we marked them and knew which ones we needed inside and which ones could stay out in the truck overnight, but if we have more than four it'll be a real hassle. As frugal as we are -- and being used to camping inexpensively in our RV when we travel -- it nearly killed us to see how much it costs for a decent motel room for three of the five nights we were gone. And that was at the best discount rate we could get (military/government were usually better than senior, AAA, or other discounts). We didn't try internet coupons or other methods of finding discounts. You can tell it's been a while since we booked a motel room. Despite the lousy economy and fewer travelers, rates keep going up. We got off pretty light financially in this regard, though. 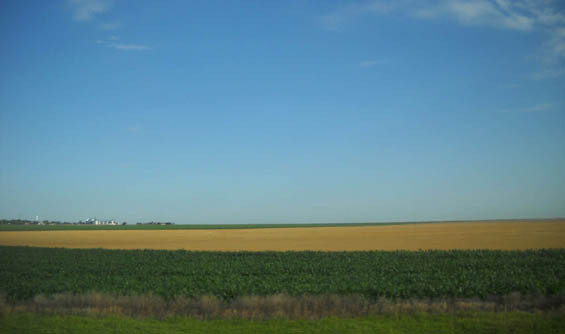 We drove through the first night, spent two nights near my brother's house in a Motel 6 in Ohio, stayed with one of Jim's sisters and her husband in Illinois the fourth night, and stayed in a nice Super 8 in western Kansas the fifth night. The Super 8 was much nicer than the Motel 6. We don't know if that is typical of those two chains but we will probably patronize Super 8 again in the future, when necessary. Although the room at Super 8 cost nearly twice as much (partly because of the $10 nonrefundable fee to keep Cody in our room) it was worth it to have nicer accommodations. 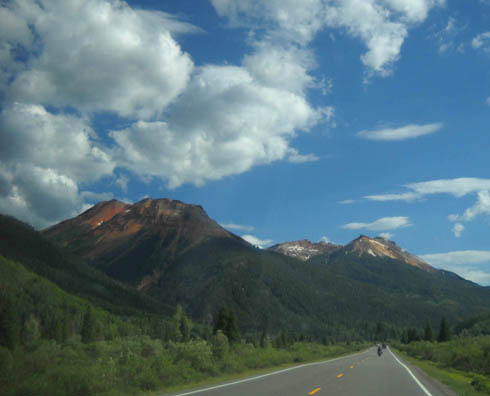 Driving anywhere fast from Silverton in far southwestern Colorado isn't possible. There are too many scenic but slow mountain roads to the north and south (you can't go due east or west from town unless you have 4WD). 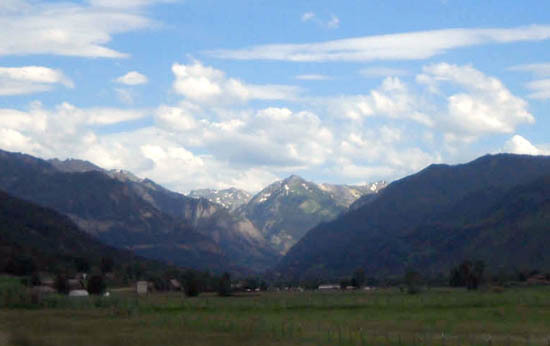 Just about the same can be said for leaving from Durango, sixty miles south -- mountains in every direction, although the roads are all paved. We absolutely had to go to Jim's orthopedic appointment last Monday morning. He needed the third and final Euflexxa injection in his bum knee and couldn't wait another week for it (the two types of visco-supplementation we are familiar with have to be injected in six- to seven-day intervals). We left Silverton at 7:40 AM, fully packed and ready to roll, had time to stop at Walmart, Subway, and a gas station in Durango before Jim's 10 AM appointment, and left the doctor's office at 10:20 AM. 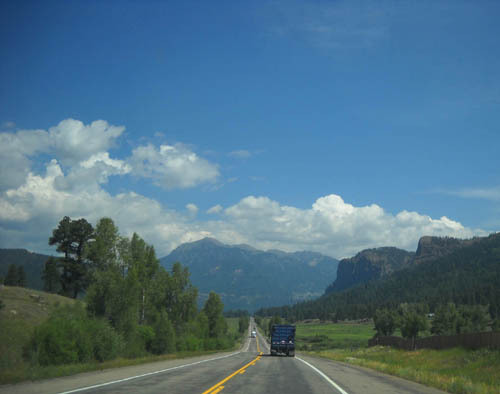 The first, and slowest, leg of our journey was US 160 from Durango east through Pagosa Springs and Alamosa, CO to I-25. 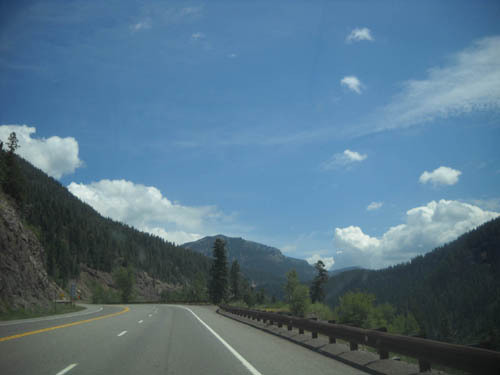 This is a smooth, scenic route through mountains and national forest land but it took us longer than we expected -- four hours to drive 240 miles (plus another 90 minutes to drive 60 miles from Silverton to Durango earlier in the morning). 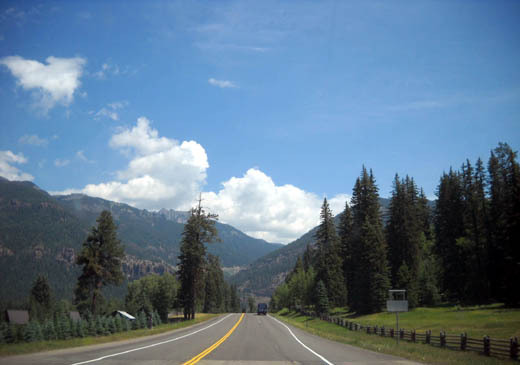 This is a good road for RVs, as long as you have time to negotiate the two-lane road. 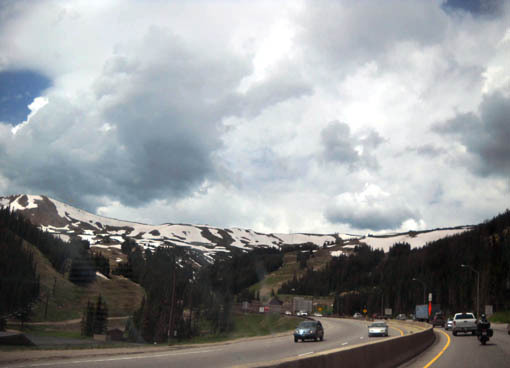 The high point at the Continental Divide is 10,829 feet. The grade up and down to it is pretty gradual. We took I-25 from Walsenburg (exit 50) to US 24 (exit 135) at Colorado Springs. US 24 is a good tangent to reach I-70 east at Limon, CO but traffic was slow through southeastern Colorado Springs because of the traffic lights. Once out of town traffic moved faster. The last part of US 24 before we reached I-70 had very rough pavement. Go slowly there in an RV. We followed I-70 east through Kansas and Missouri. There is a virtually unavoidable 32-mile section of the freeway between Topeka and Kansas City that charges a toll of $2.50 for passenger vehicles. We paid it going back to Colorado, too. We took I-64 west of St. Louis to Louisville, KY. There was plenty of road construction through Kansas, Missouri, Illinois, and Indiana on I-70 and I-64, even during the night, but the roads were pretty smooth. We followed I-71 north to Cincinnati. This hilly section of freeway is scenic with lots of trees and rock walls but the pavement was so rough we were glad we weren't pulling the 5th-wheel. Even at 60 MPH the camper would have bounced a lot. Beware if you travel this section of I-71 in an RV. We ran into lots of construction in Cincinnati during rush hour Tuesday afternoon on I-75 and I-275 North. We stayed on the eastern side of metro Cincinnati until leaving Thursday morning. We made two major changes in our route on the return trip, staying farther north both times. The first was from Cincinnati to Springfield, IL to visit some of Jim's relatives. We traveled the same route from the west side of St. Louis to Limon, CO, then drove a more northerly route to return to Silverton (not Durango). Thursday we negotiated our way through Cincinnati via I-275 south and west, I-471 north, I-75 north, and I-74 west. We took I-465 around the southern side of Indianapolis. Because of major construction between exits 9-12 we couldn't go west on I-74 at the usual exit. We had to take a confusing detour that just might have given us a heart attack if we'd tried to do it with the camper in tow! Travelers beware. We took I-74 to Champaign, IL, then got on I-72 to Springfield, IL. The pavement on all these freeways was fine, although there were some construction zones that had some bumps. This route goes through more cities and less forest and farm land, making it less interesting to me than I-64. After our visit with Jim's relatives in Springfield we got on I-55 south to I-70 west on Friday morning. There was a lot of construction on I-55 both south and northbound. We took I-270 across the north side of St. Louis and reconnected with I-70 west of town in Missouri. In Kansas City we took I-670 straight through the middle of town; it's shorter than staying on I-70. We continued on I-70 west through Kansas and most of Colorado, including straight through Denver. We got into a lot more traffic in metro Denver than we expected on a Saturday but it probably would have taken longer to drive around the city on one of the other freeways. 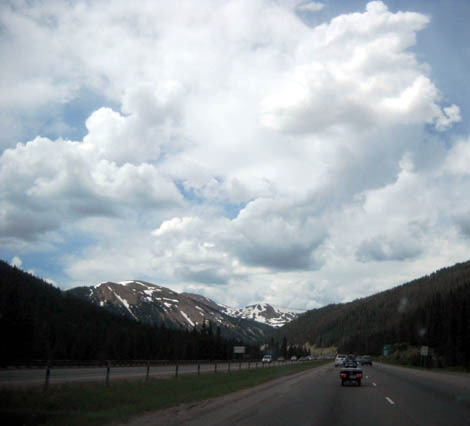 I-70 was mostly smooth through Colorado until we got to the area around Vail Pass. The pavement was the worst on either side of bridges and through a ten-mile construction area. We don't remember the road being that bumpy when we pulled the Cameo through there a month ago. 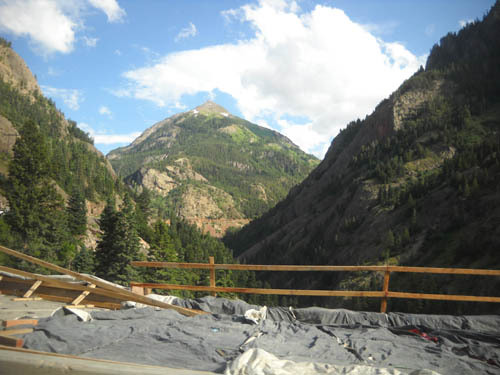 The construction we encountered in June in the Glenwood Canyon area is finished now. Traffic still moves slowly through there because of the numerous curves and distractingly beautiful scenery along the Colorado River, which is still full and moving fast. We got off I-70 at exit 37 on the eastern side of Grand Junction, CO to reach US 50 to Montrose -- the same route we took last month on our way to Silverton. In Montrose we got on US 550 south through Ouray to Silverton. Construction continues on the Million Dollar Hwy. where the mountainside eroded. The pavement on these roads is mostly smooth. The scenery is drop-dead gorgeous heading south to the San Juan Mountains. 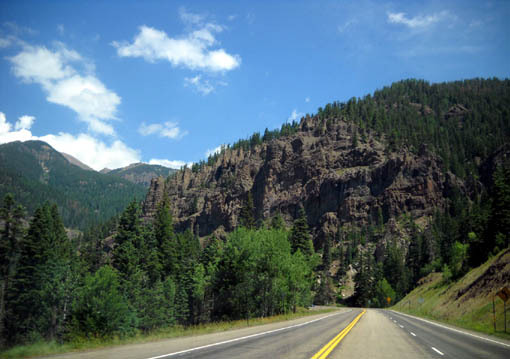 RV drivers need to take the Million Dollar Highway slowly between Ouray and Silverton; it is very narrow, with steep drop-offs that aren't as scary to me in the truck as they are when we're hauling the camper. Our truck uses diesel; I didn't pay attention to gasoline prices on this trip. The cheapest diesel prices in the seven states through which we drove on this trip were in Missouri, where we stopped at Murphy's stations at Walmart stores. Murphy's still has its 10-cent discount on each gallon of gas or diesel with a Walmart gift card. The only downside for us was having to go inside the store to put money into the card each time we needed fuel. Considering the fuel tank in our truck holds 34 gallons, I considered it worth my while to go inside and get the card. I usually either needed to use the bathroom or thought of something else to buy anyway. Some folks, including Jim, think saving $3 isn't worth the effort. My argument is that it all adds up, especially on a trip this long. YMMV. Even at other, more expensive gas stations the prices averaged less in Missouri than in Colorado, Illinois, Indiana, Kansas, Kentucky (only a few miles there), and Ohio. 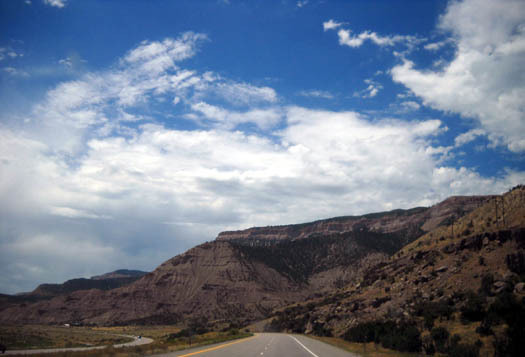 The terrain along I-70 looks different near Grand Junction, CO. The next cheapest diesel was generally at traditional "truck stops" like Flying J or Pilot (which are now the same company). We have a card for 3 cents off per gallon there. It's marketed as a card for RVers but we used it with just the truck. It's not a credit card and there is no fee for it. We recommend RVers get it. Prices I saw the last six days ranged from a whopping $4.39/gallon in touristy Ouray, CO down to $3.64 at the Murphy's/Walmart in Blue Springs, MO. I think that $3.64/gallon is the least we've paid during our summer trip, which began in early May. Our fuel mileage throughout the trip averaged about 20 MPG. With the camper in tow, driving only 60-62 MPH, it would have been about 12 MPG. As noted earlier in this entry, it was pleasant to just pull into any station we chose and not have to worry about whether we could get the Cameo in and out. Still, I would have preferred to have it with us. Other than the heat and humidity we weren't accustomed to, the weather was generally good during our trip. We outran most of the rain and lightning in a huge storm heading for Colorado Springs the first day. The clouds were so low and dark that we couldn't even see the top of Pike's Peak from I-70, and that sucker towers 7,000+ feet over the city! We heard later about a nasty hail storm in Denver that damaged buildings and planes at the airport. 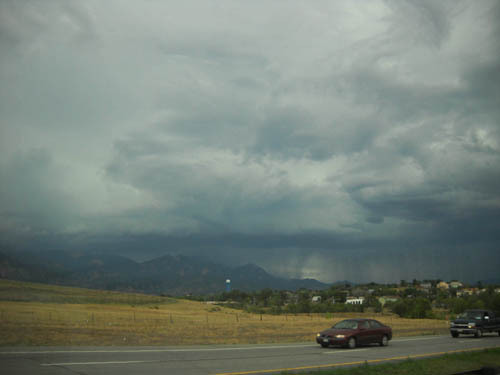 We dodged that bullet last Monday -- a nasty storm near Colorado Springs. We ran into road construction in every state from Monday to Saturday. Because of the heat and daytime traffic, some crews were working through the night in Kansas and Missouri when we drove overnight Monday-Tuesday. I was asleep in the western half of Illinois on I-64 going eastbound on Tuesday. Jim could see where the fields had been badly flooded when we drove through there in the other direction in May. Some muddy areas remain and some corn crops are very short compared to the 4-7 foot stalks we saw in Kansas and Missouri. When we got to the Wabash-Little Wabash Rivers in eastern Illinois some of the fields were still under water. Wow. On the return trip, time flew by more quickly for me when I wasn't driving because I was engrossed reading Jim's copy of Seal Team Six. It's a great read. Only problem was that I finished it in so few hours that I was wanting more but didn't have anything else as absorbing to read when we were driving through the less interesting terrain in Kansas and eastern Colorado. I dug out the very tedious book How the Mind Works and continued wading through it but it's not as fast a read as a good autobiography or novel. All of the rest areas we passed in CO, KS, MO, IL, and IN were open both eastbound and westbound. Some of them are very inviting, with lots of trees, grass, and covered picnic areas. Most of the rest area restrooms we entered were clean (but not as nice as using the bathroom in our Cameo). 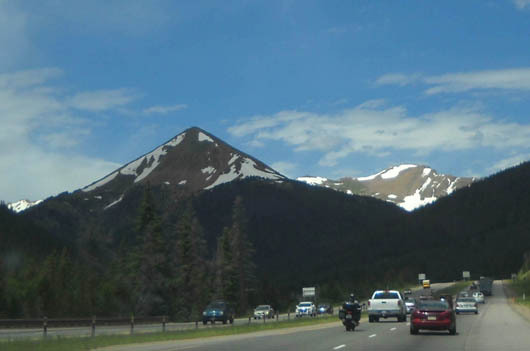 On the return today we could tell that there is less snow on all the peaks near the Continental Divide than when we drove through there a month ago . . . but still more than usual for mid-July. The snow is beautiful. Creeks and rivers are still running high from the snowmelt and monsoon thunderstorms. 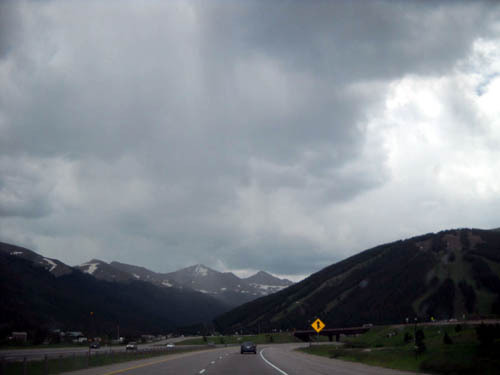 Colorado needs the rain, just not the hail, lightning, and flooding. 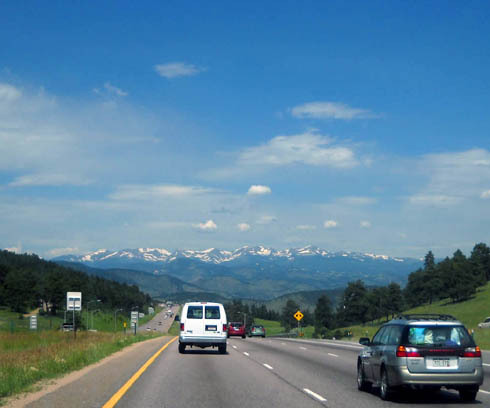 It was a relief in many ways to get back to Colorado, not just because we missed our home on wheels so much but also because of the more laid-back lifestyle and comfortable weather out West. Urbanization and humidity are equally oppressive to us. Silverton seems like one of our homes, as much time as we've spent here in recent summers. It was very good to get back today, even if it's for only one more day. We knew we were getting close to Silverton when we stopped in Montrose this afternoon to get some perishables at Walmart. On the way out who should we see but our ultra running friend Jean-Jacques d-Aquin -- the only person we know in Montrose! How lucky was that? Unfortunately he DNF'd at Hardrock again. He wondered why we weren't at the awards brunch; now he knows. We talked for only a few minutes because we were anxious to get back to Silverton. We got down there a little after 6 PM. All was well with the Cameo, although it was plenty hot and stuffy inside. We opened the door and windows so the bedroom could cool down before we went to bed. The refrigerator and freezer didn't stay quite cold enough while we were gone but none of the food spoiled. We could tell from the dirt splashed up on the tires and Big Foot feet (our leveling system) that it rained hard at least once while we were gone. Our friend Roy confirmed that, too. He drove by this evening to see if we were back yet. He kindly came by the camper periodically to check on it while we were gone. He told us more about a plane crash we heard about briefly on the radio. Apparently a little Cessna went down near Silverton during a storm and at least one person died. 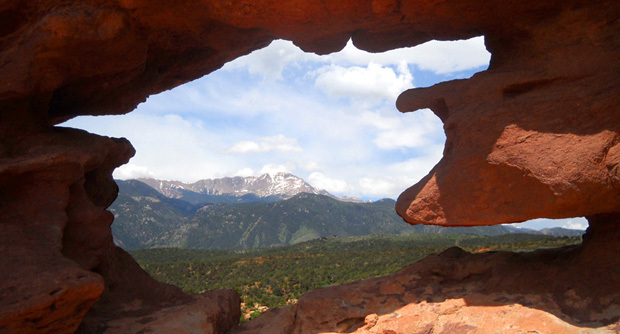 Much of Colorado has had ten days of monsoon weather and more recent unseasonable heat. That oughta melt a bunch more snow in the mountains. At least we are better acclimated to the heat now than most of the folks who live in Silverton! We'll be in Silverton just one more day. On Monday we'll head to the USAF Academy in Colorado Springs.